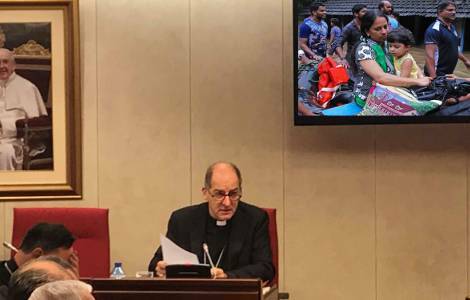 EUROPE/SPAIN - The President of the PMS: "A worldwide network at the service of the Pope to support the young Churches with prayer and charity". Madrid (Agenzia Fides) - "The Pontifical Mission Societies keep the missionary spirit alive in the Church through missionary animation and formation. The last Pontiffs insisted on the centrality of evangelization and its intimate bond with faith: mission is an expression of this dynamism of faith. Encouraging mission means encouraging the spirit of faith and, consequently, Christian witness": this was underlined by Archbishop Gian Pietro Dal Toso, President of the Pontifical Mission Societies (PMS), speaking this morning at the Assembly of the Episcopal Conference of Spain, gathered in Madrid. The Archbishop thanked "the many religious institutes and Societies of apostolic life born in this country for the enormous and essential contribution to missio ad gentes", and "which also extends with new forms of sending, including lay people and entire families" and then recalled that the financial contribution offered by the Spanish Direction of the Pontifical Mission Societies, thanks to the support of all the Spanish faithful, is in 2018, first place in Europe. This is how the entire activity of the PMS is supported, which is "a worldwide network at the service of the Pope to support the mission and the young Churches with prayer and charity". Mgr. Dal Toso remembered with gratitude the work of Fr. Anastasio Gil, former Director of the PMS in Spain, who died in September 2018 and, after the meeting with the Bishops, visited the offices of the Spanish PMS, now led by Fr. José Maria Calderon. The presence of the Archbishop was also motivated by the preparation of the important appointment of the Extraordinary Missionary Month of October 2019, promoted by the Pope as "an extraordinary opportunity for the Church, even at a local level, to renew faith and missionary zeal". "On several occasions the Pope stressed that missionary activity is paradigmatic for all the Church’s activity (cf. EG 15)", observed Mgr. Dal Toso, recalling "the missionary nature of the Church": "If it is not missionary, the Church is not herself". "October 2019 - said the President of the PMS - is part of this approach, because Pope Francis indicates a relationship between the missio ad gentes and the missionary zeal in ordinary pastoral care". "We are called to rediscover this relationship: it is important to understand the link between ordinary pastoral care and missionary pastoral care. Missionary awareness is not separate from the pastoral, but in some ways it is its apex", he remarked. The extraordinary missionary Month, therefore, "can help the ordinary pastoral care to find more strength", he added, inviting us to rediscover "the intimate bond between faith and mission, between education to faith and mission".